Sociologists Arlie Hochschild and Anne Machung used “the second shift” to refer to the responsibilities of childcare and housework borne disproportionately by women, in addition to their paid labor. Of course, the ad doesn’t actually critique this arrangement or the organization of household duties. The second shift is taken for granted, an unavoidable burden. Consumption provides the answer: buy a product that gives you more energy so you can tackle that second job when you get home. Problem solved! Husband sits on couch, reading magazine. Sigh. 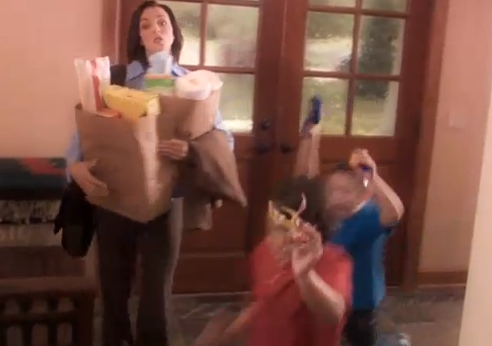 5-hour energy commercials always bug me. On the one hand, they do acknowledge a lot of different lifestyles and situations that might "require" an energy supplement. On the other, their commercials always strike me as kind of sexist. The ones I see most often are nearly identical, and at first you just think they're the same commercial, one featuring a man, one featuring a woman. Until you realize that HE gets up early to go to work, but SHE gets up early, while it's still dark, to....work out. That drink should give her just enough energy to boot the husband off the couch and make HIM go do the cooking and cleaning. Anyway, prevention is better than cure, so I think I'll skip the 5-Hour Energy and use contraception instead. As is often said on here...this ad is "enforcing" negative gender stereotypes. The question: Is the negative stereotype being enforced that women should constantly work especially in the service of their men, or is it that men are worthless and lazy? Perhaps the answer depends on the time period in which the ad occurred (the year). Most people would agree that similar ads 50 yrs ago would have been "enforcing" the former, but it seems that today's ads may have moved towards "enforcing" the latter. I'm pretty sure the "second job" is voluntary and easily avoidable. They're selling energy shots to people who would already be in positions which might make them want such shots. A "solution" would be prevention, which is great and all, but does not, as far as I know, come in the form of energy potions and does not work after the fact. The second is that the ad explicitly states that she needs to get high in order to get through the day. 1. The mom gets home late, tired and she has to carry two heavy bags (they don't look heavy because it's a commercial and they didn't want her to look SO tired. After all a woman can't perspire). We later discover her husband was at home doing nothing and he doesn't even go to help her with carrying the groceries. 2. Kids run past her screaming and they don't even bother to stop and say hello. That's appalling. More appalling is that neither she nor her husband reprimand them for this rude behaviour. 3. Kids are running around screaming and then, two seconds later, they are sitting at the table studying. What does that mean? 4. If I can assume it is a family with both working parents (otherwise that poor excuse for a man would have been in the kitchen with the lunch ready, and not sitting around doing nothing) we can infer that in the breaks from work it is not interesting for the dad to spend time with his kids. Any man with the slightest interest in his kids and a busy schedule would be eager to be with his kids rather than with the newspaper when he gets home. The new series, in which people tell what they've done in the last 5 hours, seems possibly sexist to me -- but I've only seen 3 of them, so I can only draw from what I've seen. Maybe there are more in the series. Two involve a young man who brags about all the cool things he did in the last 5 hours: parachuting, knitting while running, recording an album, etc.The newest one involves a young woman who describes all the tasks she's done in caring for a baby.On one hand, I think it's nice that it acknowledges how draining caring for a small child can be. It's also refreshing to see a competent mother on TV who looks to be in her early 20s (although I can see why that might raise its own questions.) The commercials with the young man are funny.On the other hand, when those two commercials are juxtaposed... is it just a snapshot of two individuals' lives? Or is it saying that men need energy to have fun, athletic, quirky adventures, while women need it to stay at home with kids? I don't want to read TOO much into a small sample size, but I do think it's worth considering.